Let me first apologize for the lack of screenshots this time around. None of my recent work shows in a static image, so there wasn’t much point. However, that is not to say that things were not done! Much of the polish and shining has been accomplished in the last couple of days. 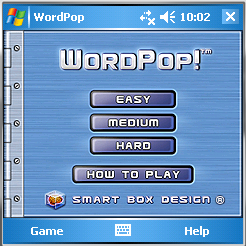 WordPop will successfully find a previous installation of the game and import all of the settings and game information. So, your best words, high scores, volume settings, and even your game in progress will be imported so you can continue with the new application right where you left off with the old. I also added the popping animation to the start screen. How many of you know that you can tap on that animation to play it again? That cute feature made the transition as well. Next, I added something you can’t see at all, but you’ll know if it is missing: sound effects. All of the same sound effects used in the current WordPop are back again and they sound great. To top it off, I also packaged the first beta release build into a CAB. That process has forced me to set up the mini-infrastructure necessary to build CABs and installers. Not a difficult task, but it does involve the wrangling of .ini files, batch files, and a variety of folders with specific names. It also involves two computers, but there’s an odd historical reason for that. All that to say that the production of a single CAB actually involved many moving parts that, I’m glad to say, seem to be working well. So, Todd has his first review build and we’ll be continuing the polishing as he gets to examine the new beast. I’ll be back to tell you more as it gets added, but it’s sure getting close now! So, I’ve finished one little thing and one kinda big thing since we last talked. 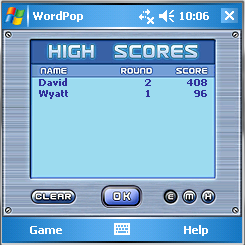 The little thing is that WordPop will remember the last name you used for a high score and present it again the next time you make the big board. Just a nice touch, nothing too difficult. And, actually, the big thing wasn’t too hard, either. That’s because most of the work was in creating new artwork and Jim did a great job doing that! 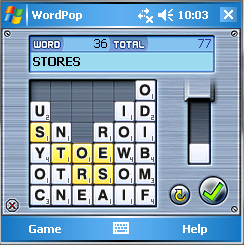 So, here are some screenshots of the new resolution we’ve added to WordPop, suitable for your Treo 700 and other 240 x 240 devices. 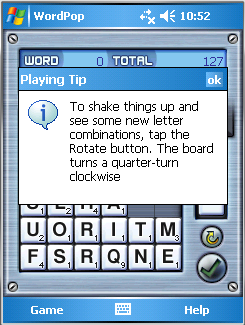 You’ll notice that the buttons have been rearranged on game board and that the dialogs needed to squeeze the font down to fit. Let us know what you think of the look at this resolution. All that’s left now is some final polishing and bug fixing. Then, I’m on to the most mundane part of software development: installers. Bleh. I’m off to touch up a few other things and then I’ll be adding the 240 x 240 resolution art. That’ll produce some fun screenshots. Talk to you again, soon! WordPop marches on. Over the last couple of weeks, I’ve been cleaning up some bugs in the Best Words and High Scores dialogs that had lingered on. I’ve also added another new feature of WordPop: tips! Tips are something we started in Farkle and have been a popular way for players to learn the game as they play. As before, you can disable the tips in the preferences. The tips are really there to get the player started and to remind them of helpful features that can be forgotten like Rotate, Undo, and the bonus tiles. There are a few more bugs on the horizon and the 240 x 240 resolution version coming up next. Jim, our fantastic artist, has already produced the images I need for that layout, so it’ll just be matter of making the game engine conform to that size. Again, this is not new for us, as we did this for Farkle and Word Monaco. Hang tough, gang. We’re in the home stretch now! http://smartboxgames.com/wp-content/uploads/2017/01/sbg_logo_whitetext_trans-1030x259.png 0 0 WyattWebb http://smartboxgames.com/wp-content/uploads/2017/01/sbg_logo_whitetext_trans-1030x259.png WyattWebb2007-10-20 23:00:162007-10-20 23:00:16Got a Hot Tip? Wow, that was far too long to not be updating you. I do apologize for the long gap. However, I did complete the next two items I mentioned. WordPop is now keeping Best Words and High Scores. We’ve added a couple of updated touches, too. 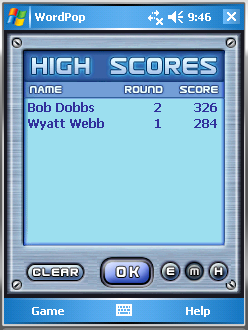 The High Scores dialog looks very similar to before. You’ll notice the new “Clear” button we’ve added. This will allow you to clear the high scores for the difficulty you’re viewing at the time. Great for removing those embarrassingly low scores before sharing your PDA with your friends. Or, as in my case (yeah, right), removing those outrageously high scores so your friends don’t hate you. The interesting part about this dialog was the three difficulty buttons in the lower right. As I was assembling the dialog, I realized that I had never added support for toggling buttons in the framework we’re using. By toggling, I mean buttons that stick down or up after you click them. 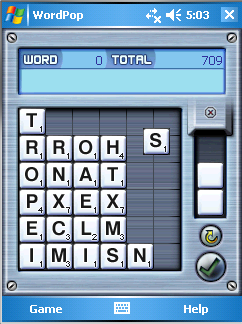 I never had need for them in Farkle or Word Monaco, so it never occurred to me until now. These act like radio buttons in that when one gets pushed down the last one pushed down will pop up. The dialog got done and the framework is just a little richer as a result. This is the Best Words dialog today. Again, we’ve added a “Clear” button to clear out this list. If you need a clean slate for any reason, it’s ready to do your bidding. The other new feature is pretty subtle, but you can see it in the first word on this list. 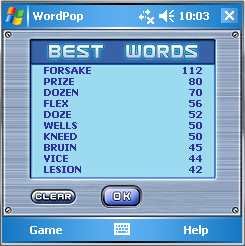 In the previous version of WordPop, using a blank tile in a high scoring word would show an underscore in this Best Words list. 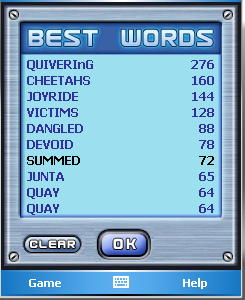 That was somewhat unsatisfying (especially if you weren’t exactly sure which word you spelled). Now, I will replace those blanks with lowercase letters according to the word matched. The lowercase N in “quivering” shows that I used a blank tile between the I and the G.
This does present an interesting possibility. It is possible that the word matched isn’t the one you were thinking of. That doesn’t change the scoring, however, so there’s no chance for underscoring your word. You just may be surprised when you see the list! So, progress continues on. My list is getting shorter and testing will begin very soon. I’ll be back with more!